The Hidden data items area was designed to perform data shaping operations by measures or dimensions that do not directly take part in the visual representation of data. The Dimension class represents a data item whose values are not intended to be summarized. The dashboard would not summarize the dimension values but process each one individually.This means that dimension values are eligible for sorting or grouping. The Measure class represents a data item whose values are summarized before they are used in the dashboard. The dashboard will calculate an appropriate summary function against measure values. For instance, measures are used to provide data for the chart's Y-axis. Assume that you have a dashboard containing a chart that shows the planned resource costs in a company by department. Now imagine that you need to sort departments by the team members. To do this, you will need to add the First team member measure to the Chart so that its data is not displayed, but only used for sorting. Drag-and-drop the First team member data field onto the Measures section in the Hidden data items area. This will create the First team member (Count) measure, which will be available in the Sort by menu. 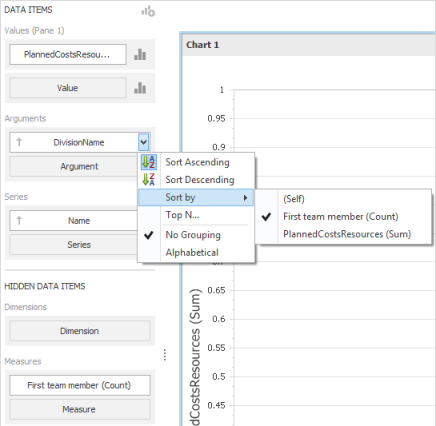 Note that the Hidden data items area is divided into two sections: Dimensions and Measures. Hidden dimensions appear in the Filter Editor dialog, allowing you to create filter criteria based on their values. For more information see Filtering. Hidden measures appear in the Sort by submenu (to sort dimension values by them), and in the Top N Values dialog (to use them in Top N conditions). Hidden data items - InLoox • Copyright 1999-2019 © InLoox, Inc. All rights reserved.